Arctic Wild Polar Bear Shot Dead for Tourism by Armed Guards. 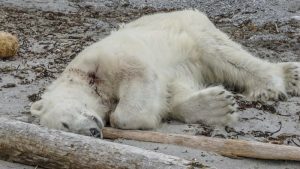 Wild Polar Bear Shot and Killed for Tourism! A wild Polar Bear was shot dead on Saturday after it attacked one of the guards who was safeguarding the area. The MS Brennan tour boat was docked on the island of Spitsbergen in Norway, with over 150 passengers waiting to get off the ship. The guard was scooping the area for bears to the protect the tourists who planned to go ashore to view these magnificent creatures when all of a sudden the guard came under attack. Unable to get away, the polar bear was shot dead by a second member of the cruise ship. This brings huge questions to Arctic tourism. The guard suffered minor head injuries that were not life threating but was airlifted to the nearest medical centre, and his condition is stable. Arctic tourism has increased over the years, with 18 more cruise ships scheduled to dock at the very same port next week. Maybe this is the reason why there has been a massive increase in Plastic Pollution in the Arctic? 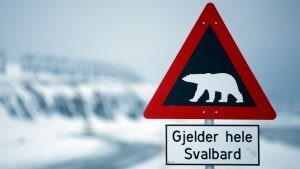 The incident sparked enormous outrage online, with the sediment that tourists should not trespass on polar bears natural habitat. In fact, perhaps tourist should not be allowed in places that require a 4 man armed security team by law! It’s sad to have events like this to occur, the iBan Plastic team is based in South East Asia. We see a lot of animal tourism here. These Animals are tortured daily for money and that epic Instagram selfie. Now we invade their homes and kill them if they get to close to us! When will this madness stop?